Sydney, 06 July 2017: Australian venture capital firm Our Innovation Fund, LP (OIF), has led a $3 million Series A funding round in cloud based Australian construction technology business Assignar. OIF is a $50 million, early stage investment fund backed by some of Australia’s leading entrepreneurs and business builders including Geoff Levy AO, David Shein and Jerry Stesel and other high net worth strategic investors across Australia, US, Asia and the UK. Assignar is a cloud based SaaS platform built to help construction contractors improve efficiency and safety by providing end-to-end real-time management of a company’s workforce, assets and compliance. Whilst sub-contractors today rely on paper, excel spreadsheets and many point solutions to track people, assets, certifications, inductions and forms, Assignar allows contractors to use digital and mobile forms enabling scheduling, compliance, communication and real-time tracking. 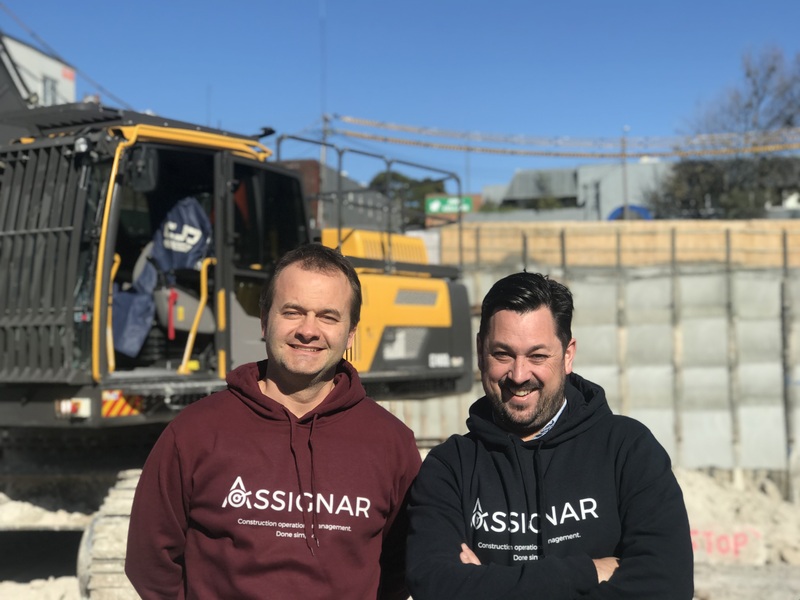 Assignar was founded by serial entrepreneurs Sean McCreanor and Marko Tomic and it now counts companies like UGL, Lendlease, Sydney Trains and Liebherr among their significant and fast growing client list in both Australia and the United States. The capital raising was undertaken to accelerate growth through direct sales and channel partners, before expanding the footprint in the US market, where the company already has a presence through in-bound leads as well as the ongoing development of the platform. David Shein, a Founding Partner of OIF, said: “We’re incredibly excited about the opportunity ahead for Assignar and we’re grateful to be partnering with such an exceptional team led by Sean and Marko. Assignar has a great product which is generating real traction in the market and that’s being demonstrated by the increasing list of customers and its fast growing annual recurring revenues. “We’re looking forward to working with the team to build on this success and to grow Assignar into a global leader in the construction software market. We believe Assignar has the potential to be a great Australian technology company, exporting its product to the world and one that we can all be immensely proud of,” said Shein. Sean McCreanor, Founder and CEO of Assignar said: “construction technology services will boom in the next few years, off the back of the Federal Government’s $75 billion investment in Australian infrastructure projects and an existing $16 billion construction pipeline”. “We couldn’t be more excited about the next phase of Assignar’s business growth. Partnering with OIF provides us with not only the capital we need to continue to grow and expand, but, more importantly, they’re a true partner that will help guide the strategic direction of the company, open doors and help us take this business to the next level,” he said. The investment in Assignar is OIF’s eighth investment since establishing in late 2016. OIF is sector and industry agnostic and is investing in innovative and scalable early stage technology businesses led by exceptional founders and a proven product-market fit. The team at OIF has a long track record and the privilege of partnering with some of Australia’s leading entrepreneurs. In addition to Assignar, OIFVC has invested in Instaclustr, Enboarder, Recomazing, EFTsure, Stream Lending and Advanced Navigation. Our Innovation Fund (OIF) is an Australian based venture capital firm that is focussed on partnering with exceptional entrepreneurs building world-class businesses. With $50 million under management OIF is building a portfolio of up to 20 investments. OIF invests in early stage businesses with innovative, high growth or disruptive technologies or business models with demonstrated market demand. The firm’s Founders, Geoff Levy AO, David Shein and Jerry Stesel, its Partners, Investment Committee members and Investors are made up of some Australia’s leading entrepreneurs and business builders. The team has significant investment, funds management, operational, and strategic experience across multiple companies, sectors, stages of development and geographies. OIF is sector agnostic and invests at the seed stage ($250k – $1m) through to Series A ($2m – $5m) where a product/market fit has been proven. OIF also co-invests with other leading domestic and offshore VCs and strategic investors.